How much do you know about France? There is much more to France than just the Eiffel Tower. Many people know France for being the birthplace of the French language, which is the lingua franca in many countries around the globe. For others, France is known for being home to the Eiffel Tower, one of the most recognizable structures in the world. Others know the country by its history, for being one of the European colonial powers in the 19th century, and for the French Revolution of the 18th century. However, there are many interesting facts that few people know about the country. 15. France has the second longest railway in Europe, after Germany. The country’s railway network is made up of 18,580 miles of railway lines, a length which is only exceeded in Europe by Germany’s railway network. Double-track railways make up the bulk of the railway network as they stretch a total of 10,218 miles in length. 1,166 miles of the railway network is set aside for high-speed lines. France’s railway network connects the country to its neighboring countries including Italy, Spain, Luxembourg, and Switzerland. The railway network extends and connects to England through the underwater Channel Tunnel. Railway systems in France account for only 10% of total passenger travel in the country. The rail transport in the country is run by SNFC, which is the country’s national railway company. 14. France used to have a monarchy. Before it became a republic, France was known as the Kingdom of France. The monarchy was in existence for 861 years between 987 and 1848, a period far exceeding that which France has been a republic. Even before 987, there were earlier dynasties in the region corresponding to the present day France, these were known as the Frankish Empires and had monarchies which can be traced far back to 486. The first dynasty was Merovingian, which was a Salian Frankish dynasty. The monarchy in present-day France was established in the 10th century with Hugh Capet being its first king and ruled between 987 and 996. The last of France’s monarchs was Emperor Napoleon III who ruled until the monarchy was abolished on September 4th, 1870. 13. Paris is home to only one stop sign. Jumping a stop sign is of least concern to drivers in Paris because the entire city has only one stop sign. The one-of-a-kind sign is situated in the city’s 16th administrative district next to the exit of a construction company’s building. According to Reader’s Digest, the only stop sign in Paris disappeared between May 2012 and September 2014, and it has not been returned. It is not clear whether the sign was stolen or it was authorized to be removed. Therefore, currently Paris has no stop sign in the whole city. The only other place where drivers are required to stop is at the many traffic lights found in Paris’ road network. Though there are no stop signs in the city, there are other numerous signs in the city that keep the streets of Paris plunging into chaos. The most common sign is the red circle with a line at the center, indicating “Do Not Enter,” a sign showing a one-way drive. There are other many “No Left Turn” signs. 12. French cuisine is one of the most influential cuisine types in the world. While the global popularity of French cuisine has been waning in recent years, it is still among the world’s most influential cuisine types. The cuisine type is featured in virtually all significant eateries around the globe. The country has in recent years strived to revive the prominence of French cuisine in the world by hosting a major culinary event known as “Good France” in which the best in French cuisine is on offer. 11. France is home to amazing historic caves. 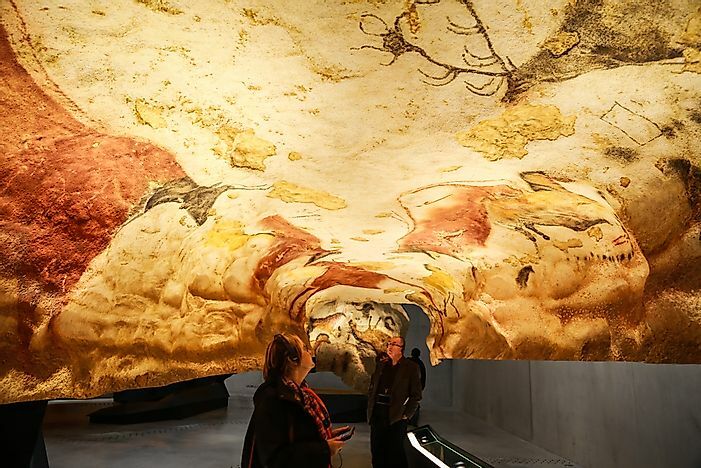 The Lascaux caves are among the top tourist attractions in France, and they were even designated as UNESCO World Heritage Sites. What makes the caves stand out is that on their surface are some of the best-preserved prehistoric cave paintings in the world. The paintings offer a glimpse into France as it appeared prehistorically, and are proof that lions, rhinos, and hyenas once lived in France. Despite the cave paintings dating back 30,000 years, the attention to detail on the caves is astonishing. Open to the public since 1948, replicas of the Great Hall of the Bulls and the Painted Gallery caves were created in 1983 as a means for tourists to see the site while protecting the prehistoric paintings. 10. France receives more tourists than anywhere else on Earth. Tourism is an important economic pillar for France, accounting for about 9.7% of the country’s GDP. About 85.7 million international tourists visited the country in 2013, the largest number of foreign tourists in the world. No other country in the world reached the 70 million mark, with US recording 69.8 million visitors. More than 6.2 million of the international tourists come from Switzerland. France shares a border with eight other countries and this makes it easier for tourist to access the country. However, Germany shares its borders with nine other countries, while China and Russia each share borders with 14 countries, and they come nowhere close to France. 9. France has five overseas departments: French Guiana, Guadeloupe, Martinique, Mayotte, and Reunion. The territory of France extends away from the confines of Europe, with the country having three overseas departments. Three of the departments (French Guiana, Martinique, and Guadeloupe) are found in the Americas, while two departments (Reunion and Mayotte) are situated in Africa. These departments are recognized as part of France, and hence have all the political and economic systems of mainland France which include the use of the Euro as the official currency and participating in the country’s general elections. 8. France has the third largest number of UNESCO World Heritage Sites of all European countries. France has 43 properties listed as UNESCO World Heritage sites, the third most of any country in Europe. The first of France’s properties were inducted into the list of UNESCO sites in 1979 when a total of five properties were listed. There are 37 sites which are tentatively listed and waiting for approval. Taputapuatea in French Polynesia is the most recent to have the designation, as the Polynesian cultural center was listed in 2017. Out of the 43 listed sites, 39 are world cultural heritage sites, 3 are world natural heritage sites, and 1 is a mixed world heritage site. Of all the sites listed, 3 are transboundary properties. 7. France's national day is Bastille Day. It is celebrated on July 14th. The day represents the day in 1789 when Parisians attacked Bastille, a fortified prison that held political prisoners who were condemned by the country’s monarchy. 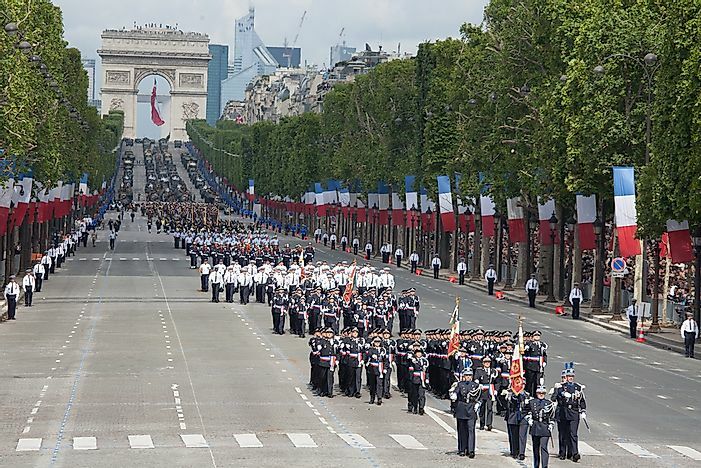 Europe’s oldest regular military parade is conducted during this day and is witnessed by, among others, the President of France. 6. France is a founding member of the European Union. France is among the six original countries who founded the European Union. These six countries, which are also known as the “Inner Six”, are comprised of West Germany, France, Italy, the Netherlands, Luxembourg, and Belgium. The six countries came together to sign the 1951 Treaty of Paris that resulted in the European Communities’ establishment which would later transform into the European Union. 5. France is the one of the world's biggest exporter of films. The popularity of films made in France is felt all over the world. As testament to their popularity, France has the second-largest film exports in the world, only surpassed by the United States. The country also features prominently in global film markets, and with over 0.212 billion tickets being sold nationwide in 2016, is the world’s third largest film market, only exceeded in ticket sales by the United States and India. 4. France's official flag, the Tricolor, is one of the world's most recognized flags. Despite not being the oldest tricolor flag in the world, the Tricolor is one of the best known flags in the world. Jacques-Louis David is credited for the tricolor design of the flag, which was adopted as the country’s national flag on February 15th, 1794. Another interesting fact about the flag is that originally the three bands that make up the tricolor were not of equal size, with 30:33:37 proportions of blue, white, and red respectively. 3. France is home to the Millau Viaduct, the tallest bridge in the world. The Millau Viaduct is a tall bridge situated in southern France. 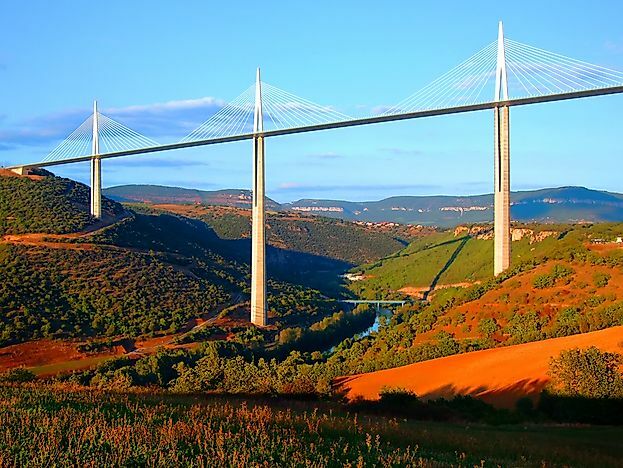 The bridge which crosses the Tarn River gorge near the town of Millau is the world’s tallest bridge. The Millau Viaduct is comprised of a road deck which is connected to seven pylons by cable stays. The tallest of the pylons that support the bridge, P2 rises 1,125.3 feet above the base of the bridge, making it taller than the Eiffel Tower in Paris. 2. France's healthcare system is often ranked among the best in the world. Provision of healthcare is paramount in the French government’s priorities. France spends about 11% of its annual GDP on healthcare, which translates to over $4000 per capita. 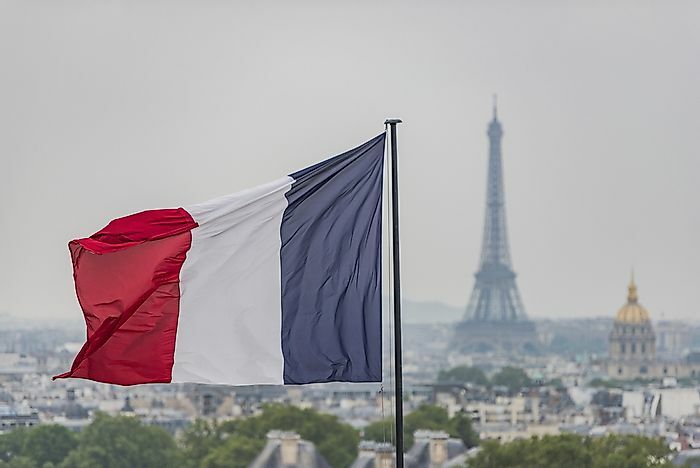 All French citizens are required to pay health insurance, which is paid to non-profit insurance agencies in the country. 1. France is the largest country by land area in the EU. France’s territory covers an area of 211,209 square miles, which makes it the largest country in the European Union. The country’s land area is only exceeded by that of Russia and Ukraine in Europe. The land area makes France about three times larger than the United Kingdom. This page was last updated on April 23, 2018.